EMSNESTRY4PCBLK : Mind Reader Mind Reader Ems Mind Coffee Pod Anchor Drawer - 50 X Coffee Capsule - 2.4" Height X 9.2" Width X 15. 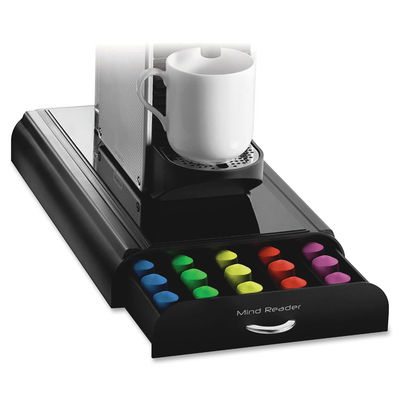 Mind Reader Ems Mind Coffee Pod Anchor Drawer - 50 X Coffee Capsule - 2.4" Height X 9.2" Width X 15. This Holder Is Built To Last With Attention To Detail And Superior Materials. Durable Construction Lets You Safely Place Your Coffee Machine Directly On Top Of The Drawer. Heat-Resistant Panel Keeps Coffee Pods Safely Protected Underneath. Large-Capacity Design Holds Up To 50 Nespresso Capsules (Sold Separately).. This Holder Is Built To Last With Attention To Detail And Superior Materials. Durable Construction Lets You Safely Place Your Coffee Machine Directly On Top Of The Drawer. Heat-Resistant Panel Keeps Coffee Pods Safely Protected Underneath. Large-Capacity Design Holds Up To 50 Nespresso Capsules (Sold Separately).